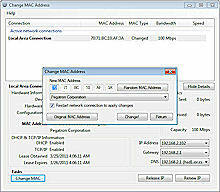 Change MAC Address - Change Your MAC Address with Two Clicks! 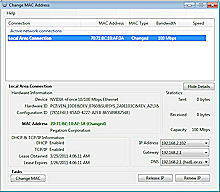 Change Your MAC Address in Just Two Clicks! Stop getting banned from online games! Help yourself get authenticated by your ISP! Protect your privacy with WiFi networks! Want to Change Your MAC Address? This Simple App Does It For You. what it says on the box. Just two clicks and you're done. There are many reasons you may want to change your MAC address. You may wish to PROTECT your privacy when connecting to WiFi networks. You might want to PREVENT yourself getting banned from online games, based on your MAC address. You may want to SPOOF a specific MAC address to help work around ISP authentication problems. And as your MAC address is unique to your network card, anyone with the right tools can effectively TRACK and MONITOR your computer network activity, once they know its address. But all of this is EASILY SOLVED. Just a couple of clicks with ?Change MAC Address' -- and you're protected. with just a few simple clicks! Some ISPs authenticate based on a MAC address. Power users can finally regain control! Many online gaming websites ban users based on their MAC address. Just reset and start gaming again! DOWNLOAD Your Copy of 'Change MAC Address' NOW! Want to purchase your copy of 'Change MAC Address'? The full application, including LIFETIME support, costs just $16.95. Price approximately £10.95 or 12.95 Euros. Converted to local currency. Software made available as an instant download. Windows only.